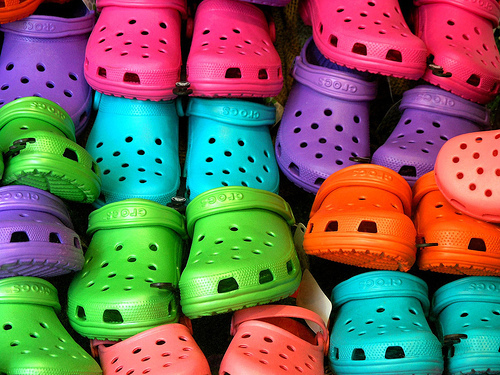 Ashbee Design: Crocs 'n Socs? 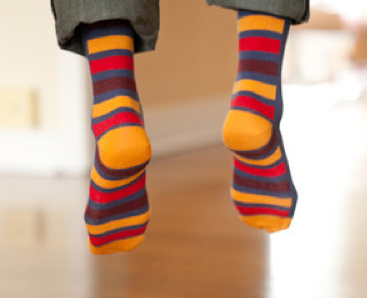 Today in the Fab.com post there was a site selling crazy socks. I love them - bright and funky. And on crazy sale if you are a Fab.com member. Lets Have Sox - Crazy Socks for all Ages. My question is this. Can you wear crazy socks with crocs or is that still a fashion fail? What with summer here, I am in crocs and shorts all the time. Like right now! Sometimes I just want to have socks on as well. What do you think? Is it okay to pair crazy socs with crocs and shorts? Just wondering. Have a wonderful 4th of July! the point of airy shoes are that they let air and sunlight onto your feet to kill nasty bacteria. socks defeat that purpose. yes, socks still allow some airflow but it's not the same thing as naked feet. I love crazy designs and bright colors but am a purist when it comes to keeping my piggies healthy. Just dye your hair mauve or paisley instead. But sometimes those naked feet are COLD! Paisley hair, while intriguing, won't warm up the feet. :-) Thanks for the comment. Made me smile. I say go for it. ALL my shoes are crocs and I wear socks with them lots of times!